Written for the AQA Step up to English Entry Level 1, 2 and 3 Certificates for first teaching from September 2015, this resource is full of practical information and guidance for planning and delivering the course. Designed to be used with the Cambridge Elevate Step up to English resources, this guides teachers through choosing projects to suit their timetable and classroom needs, using Cambridge resources to co-teach in mixed-ability classrooms and assessing students’ progress towards being GCSE-ready. 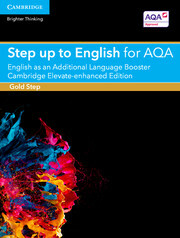 Full planning support for the AQA Step up to English Entry Level Certificate, written for non-specialist teachers. Designed specifically to support Entry Level learners, each project uses group work and active engagement to inspire students to develop a love of learning. All documents are provided in editable format so they can be tailored to the learners’ specific needs. Includes support for combining projects from different levels of the qualification, adapting delivery to suit EAL students, to support effective differentiation in the classroom. 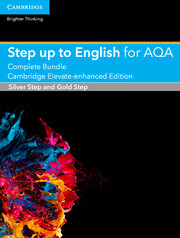 Also available within a Complete Bundle Pack, alongside resources for Entry Level 1, Entry Level 2, Entry Level 3 and EAL learners.